Perched on the slope of an evergreen valley overlooking the Atlantic Ocean is Valverde, the town capital of El Hierro. As with many unique things about the pristine island, Valverde is the only landlocked capital in the Canary Islands. At an altitude of almost 600 meters above sea level, the town can be foggy. Hence, Valverde is also fondly called the Village Above the Clouds. On a clear day, a view of the low white houses with ochre roofs contrasting the surrounding greenery is as picturesque as it can be. The town is also a stunning natural balcony, with views over Tenerife and La Gomera. Even as it portrays the role of the island’s center of commerce and services, Valverde has preserved its tranquility and delightful simple way of living. Located in the north east of El Hierro, Valverde is the religious, social and administrative center of the island. This ancient settlement was founded during the initial stages of the conquest of the Canaries at the end of the 15th century. Originally belonging to the Counts of the bigger island of La Gomera, it has gained political independence four eventful centuries later. However, much of the original Canarian architecture were damaged by a devastating fire that hit the town in 1899. Still, Valverde managed to fix what was damaged and strive to preserve the beautiful structures that were spared. At present, the smell of the town’s colonial past still hangs in the air. A stroll through the quiet streets of Valverde offers visitors a peek into the island’s past. Age old churches dot the town as well as buildings with traditional Canarian architecture. Those who have a penchant for old, historical places will surely find this township a jewel in the crown of El Hierro. Perhaps the best place to start when visiting Valverde is Plaza Virrey de Manila. Wander around and admire the dazzling tile patterns that seem to change shapes and colors under the bright sunlight. To the right, the impressive town hall dominates the scene. 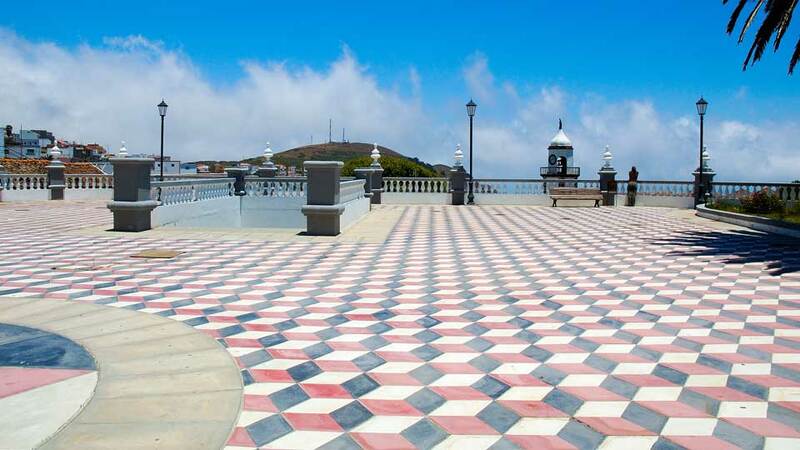 A walk to the white-washed fortification will also give visitors an impressive view over the Iglesia de Nuestra Señora de Concepción. Visitors who’d like to know more about the rural island life in El Hierro will surely complete the puzzle at Casa de Las Quinteras Centro Etnográfico. This handicraft museum has fascinating displays including a blacksmith’s forge and traditional clothing. There are also ceramics and interesting things like the ancient gramophone made out of a block of wood. For those who’d like to have a token from the island, the craft shop outside selling local goods is the place to be. These old houses are just two of the architectural marvels in town that should not be missed. The House of Dr. Gost is now home to the Institute of Architects. Its lovely façades make these eye-catching structures stand out from the rest of the houses. Also, the woodworks of the beautiful interior patios are a delight to the eyes. 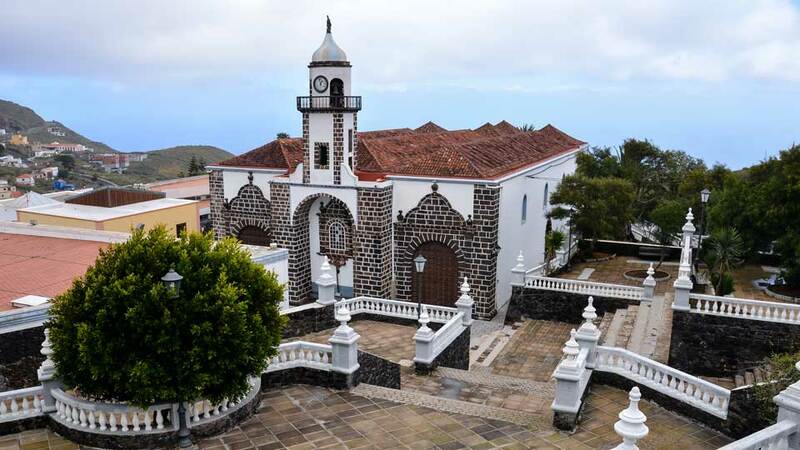 This simple three-nave structure built in 1767 is the largest church in El Hierro. The façade is neo-baroque, and it is crowned by a bell-tower with a railed-off upper level that serves as a lookout. Inside, the original dimensions with high ceilings have been maintained. Much of the town’s heritage is housed in the church, including the polychrome of Our Lady of the Immaculate Conception who looks over the church. El Hierro’s airport and main seaport are in the municipality of Valverde. Those who are arriving by air will have to travel 12 kilometers from the airport to Valverde town proper. Several car hire services have offices in the airport, and the journey takes less than 30 minutes. Meanwhile, visitors arriving via ferries are welcomed by Puerto de la Estaca, located 14 kilometers from the town proper. Those driving on their own may take HI-2 and then HI-1 motorway. Alternatively, travelers may benefit from the bus service Transhierro which covers most of the island including airport/seaport to Valverde routes. The schedule is available at www.transhierro.com and guests may contact the bus company at (+34) 922 551 175. Indulge in an extended stay at one of the Canary Island’s quietest island capital. This charming town has some of the coziest and comfortable holiday rentals in El Hierro. Hotel Boomerang boasts spacious, comfortable units that are perfect for the whole family. A family-run place, guests are treated to a personal and friendly accommodation experience by the staff and the owners themselves. Guest of this hotel love the rooms with balconies and stunning views of the scenery. Also, its location in the heart of the town makes staying and traveling even more convenient. This charming holiday rental beautifully blends rustic and modern styles together. El Hondillo is complete with the amenities every visitor may need, including a dining and kitchenette area as well as cozy rooms. At the end of the day, why not enjoy some barbecue party or simply watch the sun kiss the horizon at its lovely terrace. Hostal Residencia Casañas, located in Calle San Francisco, is the oldest hotel on the island. It opened in 1969 and has undergone several reconstructions. These improvements made the hotel ideal for an overnight stay. Moreover, the hotel is close to the bus station, taxi ranks, bars and restaurants making it easier to move around with this as starting or end point. Valverde has some of the best restaurants serving traditional cuisines with an eclectic mix of imported ingredients. The permanent features on the menu are the mouthwatering local cheese, champurrio or vegetable broth and fresh, home-grazed meat. All these can be washed down with excellent local wines. Combining a courtesan’s boudoir with 1950s memorabilia, Tasca El Secreto offers a quirky dining experience to its guests. Meanwhile, the food is surprisingly conventional and very Canarian. Visitors should not miss the patatas bravas, croquettes, and their delicious queso fritas. While waiting for the food to be served, diners may grab a book from the restaurant’s book shelf. La Miranda Profunda is a small, stylish restaurant in Calle Santiago. Here, there is no written menu. The friendly restaurant chef approaches each table and describes what is available. Although a bit more expensive than other restaurants, the gourmet food prepared by the chef is definitely worth every penny. The restaurant can accommodate anyone, from families to single diners. Because it’s location is a bit far from the town center, El Encuentro is less frequented compared to other bistros. However, those who are willing to go a bit out of the way will surely want to return to this gem of a restaurant. The dishes, from their soups, main courses, to desserts, are a feast of flavors. To top off meals, El Encuentro also offers a delightful selection of local red and white wines. Valverde takes pride in being the island capital of the archipelago’s most unspoiled island. However, there is more to this town than just being the bureaucratic center. A lovely stroll in Valverde is a delightful trip down the history lane. Almost every structure, from its stunning age-old churches to its traditional buildings had witnessed hundreds of years of stories. Its white-washed houses and warm and friendly locals can beat the cold on this high-altitude place. All these and more await the increasing number of visitors wanting to discover this peaceful town above the clouds.